This is an Italian Renaissance style manuscript illumination on 6x8" sheep parchment. Genuine gold leaf on miniatum base. Pigments hand tempered in gum. Most pigments made by hand from natural materials and all are appropriate to the time and place (except cochineal): Lapis lazuli, coarse azurite, fine azurite, woad, cornflower, weld lake, lead/tin yellow, buckthorn yellow, red ochre, vermilion, red lead, cochineal, brazil lake, dragon's blood, white lead, lamp black, iris green, and malachite. 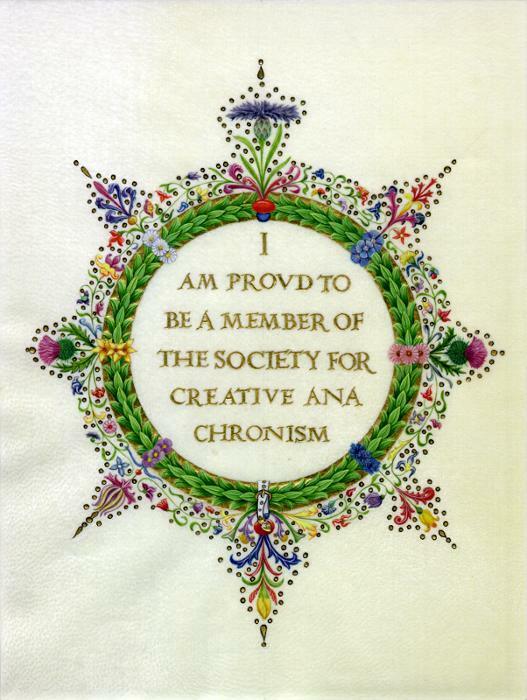 This artwork was created by Randy Asplund specifically for an auction to be held at the Pennsic event in August 2012 to benefit the Society For Creative Anachronism. The design is inspired by actual period design elements, but created as a complete original, not a copy of an existing piece. The style is book art, and many of the pigments used are book pigments which are not permanent under direct sunlight. This work should be framed under UV protective glass with a layer of matte board between it and the glass. It should never be hung on a wall that receives direct sunlight. Techniques used to make art like this can be seen on my articles page.